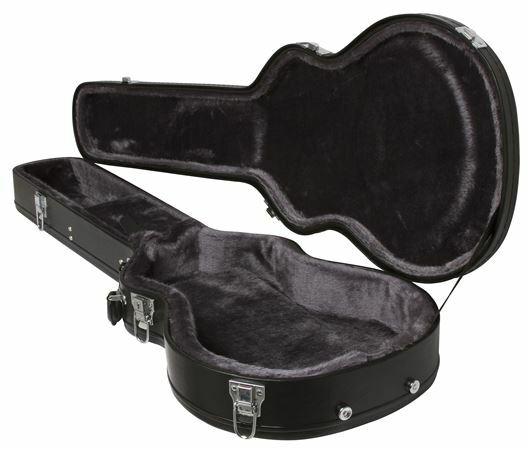 Shop Epiphone Deluxe Les Paul Style Electric Guitar Case from AMS with 0% Interest Payment Plans and Free Shipping. Epiphone's cases are designed specifically to fit Epiphone models and provide top quality protection for your investment. Epiphone's passion has always been about more than just making guitars. It has been about making music. It has been about understanding what is inside every musican that makes them want to, have to, express themselves. And understanding the myriad musical styles, where they are going and how they might develop. For over one hundred and twenty-five years they have continually looked for new and better ways to help players take their music farther. Epi Stathopoulo, their founder and namesake, was always on the forefront of music. He was the first instrument maker to embrace Jazz music and led the industry away from mandolin and banjo production and into making guitars. At the age of twenty-four Epi obtained his first of many patents that would change fretted instrument construction forever. The extension truss rod design, the first pick-up with individual pole pieces, and the Tonexpressor - the precursor to the modern day "wah-wah" pedal - were all epiphone innovations. But perhaps the greatest contribution to guitar making came in 1941 while Les Paul was experimenting in the Epiphone factory. These experiments led to the Les Paul "Log" and the first solid-body electric guitar. The same sprit of innovation that drove the Stathopoulos to start pushing the boundaries of guitar design over one hundred and twenty-five years ago is alive and well at Epiphone today. Styles of music will continue to evolve, new technologies will come and go and new players will continue to take music and guitar in new directions. But their passion for making music and their mission of providing musicians with a great instrument they can rely on to express themselves will always remain constant. I love the soft leather look of the exterior of this case, it's not like a regular crackle surface, the interior is very plush and soft, and a perfect fit for my epiphone-les paul. My Epi LP fits perfect. Case does exactly what it's supposed to do! Great deal it was a blemish could not even tell. This is a great case for my Epiphone Les Paul. Provides much better protection than a gig bag. Great Les Paul case!! Meets all aspects I hoped it would!!???? And for the price you can not beatIt!! I ordered 5 total and going to get more! !